My local “Friends of the Library” group has just raised enough money for an external Library Notice Board, and today the board was fixed to the Library railings. I feel rather proud. The board will display information about what’s on inside the Library building. Pedestrians outside, seeing the notices, might be encouraged to come inside and make use of the town’s Library itself. So today I’m happy and positive and, although not everything is perfect, I live where there is a Very Nice Library. Yet my heart sinks. Right now there are rumblings of more cuts on the way. Nothing to do with the Big Government, of course – ha ha! - as these will just be local cuts for local people. Older people. Retired people. People probably out of work or on low income. People with disabilities. Mothers. Children. Fathers. Carers. Children’s health clinics. Parents. Students of all ages. Solitary teens. Lone readers of all ages. People who like the conversation group. People learning English as a second language. Reading groups. Computer groups. Local history groups. A WI group. A handicraft group . . . And all of them involved with reading in some way. It is a busy library! Busy. Warm, Friendly. A place for browsing. For meeting. Free to all, without means testing, and funded by taxpayers money. Possibly the last space in this tourist town where you can sit, rest, work or read without paying. In many ways, this local Library is the last indoor democratic area. Now I don’t want to offend people, but I do get angry – very angry – when newspaper and other articles suggest that a nicely-decorated ex-phone-box crammed with book shelves is “a Library”. It isn’t, not for me. It’s a nice, enjoyable community project and I’m very glad that such things exist and am happy for the people who care for it and make use of it and the places where they are found. However, as council library services are being decimated, I resent the way that local media and local bigwigs promote such “pretty new library” stories, implying that these libraries will make up for all the lost Public Libraries. A library is more than a collection of books, isn't it? I feel blessed because this post is about my local library, right now. Happy face. I also know that - right now! - libraries in Liverpool and elsewhere are being hacked about, weakened, cut and closed, their school library services shut down and, I suspect, companies approached to take over “ailing services”. For non-profit? Ha! Angry face! Yes, people. It’s cultural vandalism gone mad! Grrr! Put that on any new Notice Board as a warning for passing people to see! Our local library is the centre of the community and one of the busiest places in the local area. It is all the things yours is. People need it. And we still have councillors who think the library is a luxury! Ours is safe at the moment, though it was threatened a few years ago. But earlier this year we lost our librarian in charge - everyone at her level was made redundant - and those left are run off their feet. Not good. Sue, losing the librarian is exactly the kind of situation I fear. Boxes get ticked somewhere for just enough "bodies present", meanwhile forgetting that the helpful volunteers ARE volunteers, and apt to leave when they feel under the wrong sort of pressure. Catdownunder, so sad to hear about the wilful ignorance of some of your councillors too! Libraries are an indicator species for the health of a civilisation. Hurrah! On behalf of librarians everywhere, thank you. Sometimes it feels like it will only be when they are gone, that people will wake up to what has been lost. An inspiring post, Penny. Yes I think 'my' library is safe for the moment. The mind boggles at the idea of libraries being run entirely by volunteers. What if we extend this to hospitals as well. Sorry no more money for nurses so now we just have volunteers! What bothers me as well, is that there are so few school libraries. 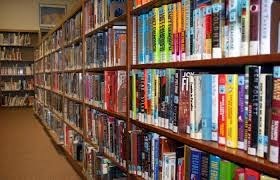 School libraries should surely be the hub of any school. Yes, Mr Mustard! The library plans and cuts are often totally erratic. Obfuscating too. A while back, when people protested against library cuts, there was a "Survey", which was paid for by cutting library book purchases for that year. Apologies, blogpost readers. The word "sit" was taken out of the line "easy chairs so people can reading papers and magazines and books (or snooze)" when I was doing some last minute editing. Hope that was obvious!